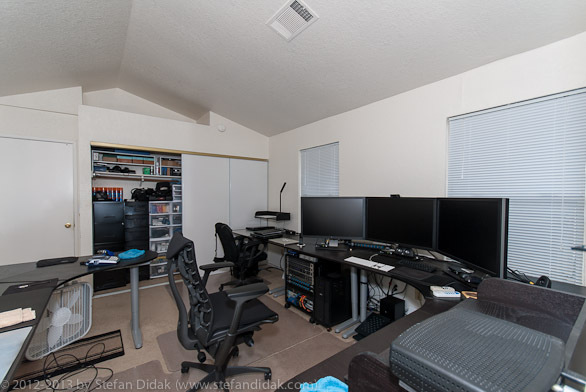 Are you looking for my other, previous, insane multi-monitor home office setups? This page is dedicated to “my biggest fan”. 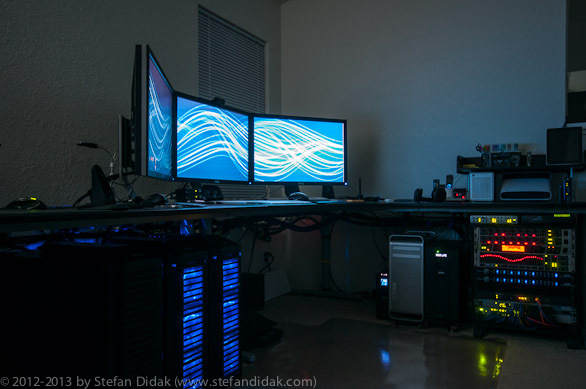 🙂 A lot of thanks to Chris and Andrew over at ComputersUSA for building some of my new systems to-order and doing an amazingly wonderful job at it. 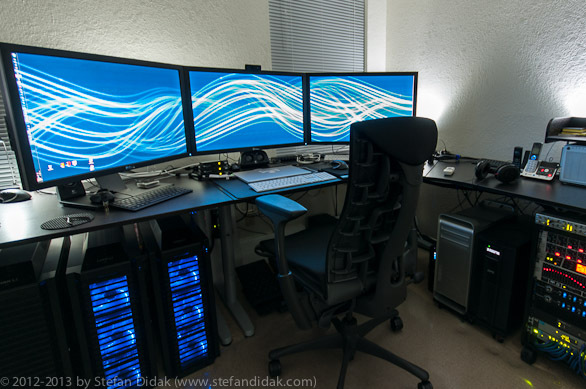 On this page, it’s all about the current version of the office, known as “version 7.0”. I like working in a dark office. The darker the better? Not really. The light emitting from the screens can sometimes be a real pain in the eyes (and yes, I know how to turn down the brightness and contrast). So what you want to do is get enough ambient light in there to offset the harshness of the screens. 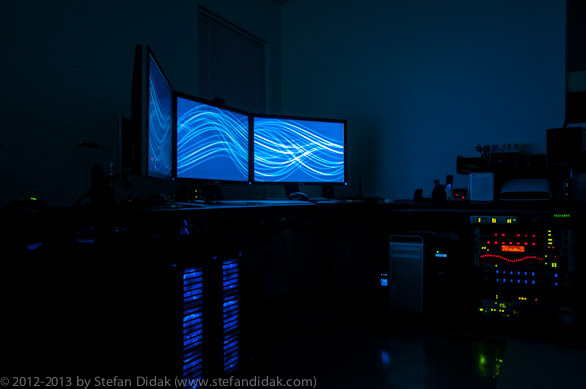 I’ve experimented with many different solutions over the years and found that being able to increase and decrease backlighting behind the screens and areas where you can’t really see the lights themselves works best. Plus it has a nice aesthetic feel to it when walls light up and provide ambient scattered light without really seeing where the lights, leds, or bulbs are located. 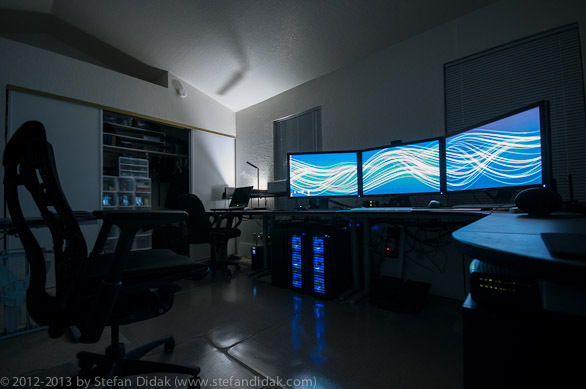 The picture above shows average ambient light. 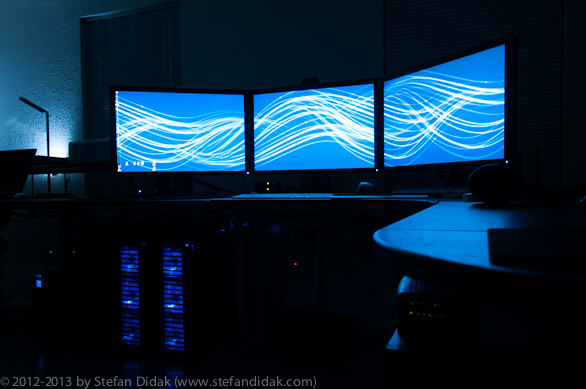 More ambient light, backlit, behind the screens. 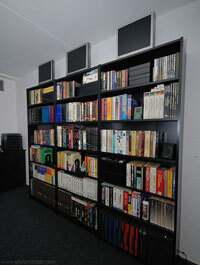 There’s a few high powered LED USB lights behind there which I can turn on and off with a remote control. 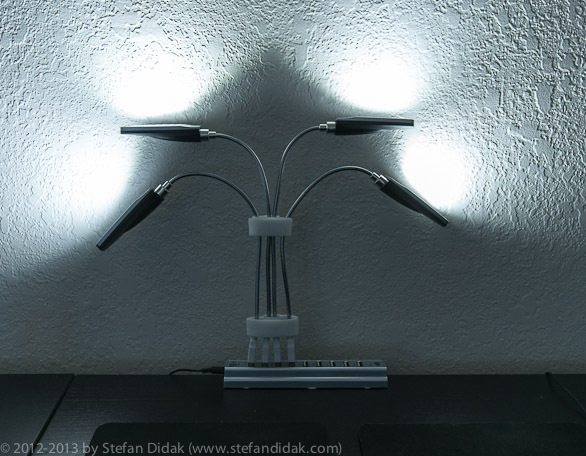 The USB lights themselves can be set to 3 different levels. In the picture above it uses full power. Via a remote control you ask? Yes, easy. You get some of those devices you plug into the outlet and are remote controlled, then stick the USB HUB power adapter in there and voila, you’ve got remote controlled USB LED lights. I’ve got about a dozen of those device triggers in the office. Each remote control can control 5 of those devices. Really great and not too expensive for like $19 each. A picture with just the ambient light in the office coming from the opposite side of the office where a few monitors were casting a bit of ambient light around. 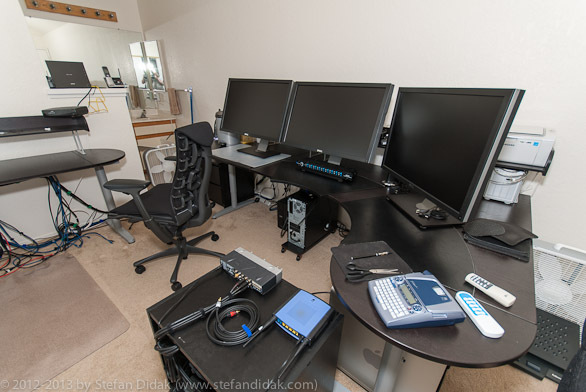 Same shot, this time with the monitors turned on. Just in case you were wondering. 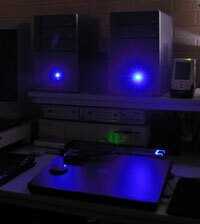 The ambient light, or lack thereof, when I’m only working in the main “area”. Dark, yes! A little more light in the corner to break the darkness just enough to not feel like a mole. And another high powered LED light turned on to provide even more light. 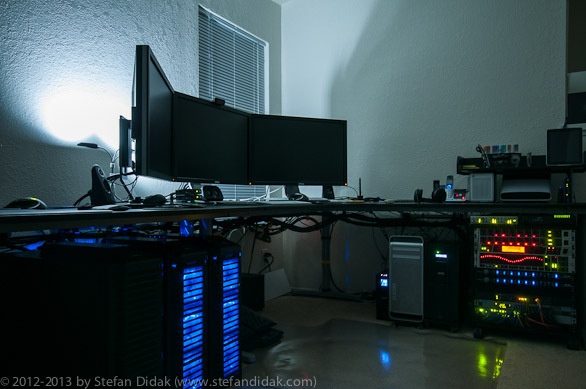 Once I start turning on all the USB LED lights in the office it is light enough that it’s almost as if there are regular bulbs and lights in there. Plenty of light to work by. Don’t believe me? Check out the next shot then. Yep. Plenty of light at night! 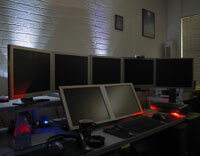 One of the remote controlled USB LED light clusters that sits behind the monitors. Being able to adjust the angle is great but you know, once you’ve got them at the angle you like you hardly ever fiddle with them again. Which I guess is a good thing because I’ve got so many of these around the office it would be a day job just to fiddle with them in order to see the various lighting patterns it can create. The few dozen USB LED lights around the office are sold under many different brand names but you might be able to find them if you Google for 26 LED USB Lights. 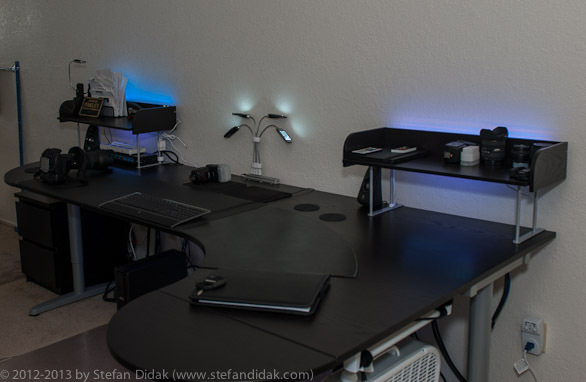 Multicolor LED strips mounted behind the desks and underneath. For “extra effect” and coolness. 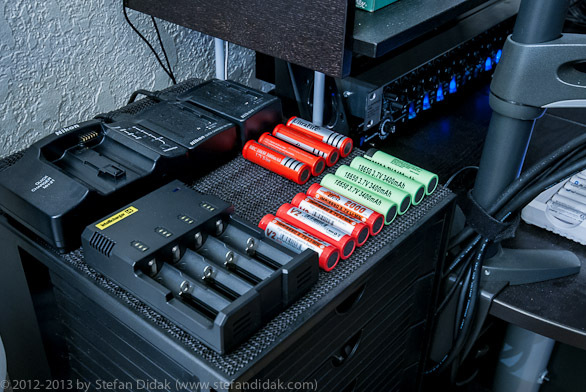 In the meantime I got myself a great 16-battery charger to deal with volume charging of tons of Eneloop batteries for the Nikon Speedlight flash units. This thing cranks through rechargeable batteries like you wouldn’t believe. 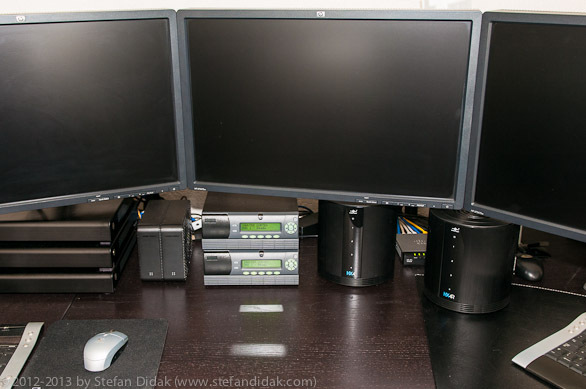 More pictures of the Mini ITX Xeon Servers on my Flickr. I’ve been getting a lot of questions about these after I posted some pictures to Flickr and Twitter and I bet the questions will continue to come so here’s the specs. 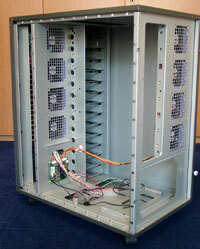 And in case you need to know, at the time I got them these things ran somewhere $1200 each. 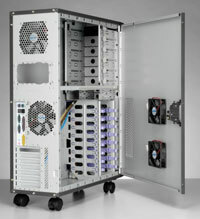 Great for building a small server farm where you want a little more individual metal vs. a huge large box that has combined memory and storage (and use up many more Watts to run). 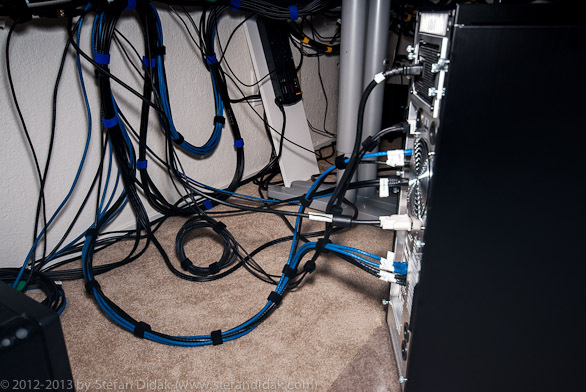 The cables at the back of these three Mini ITX Xeon servers. Notice that I use USB extension cables at the back and route them to a place I can easily get to. 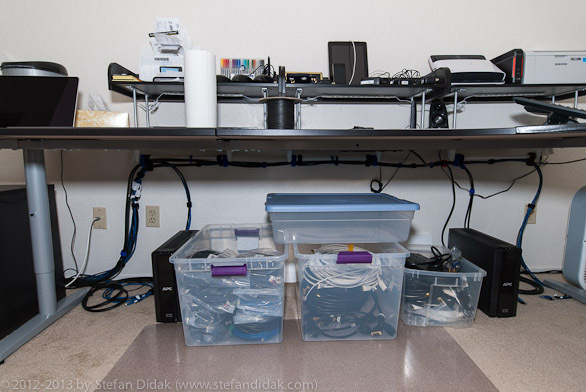 This way I don’t have to crawl under desks or move systems around if I need to plug some USB device in. I use this trick on many systems that are not as easily accessible. Works great. 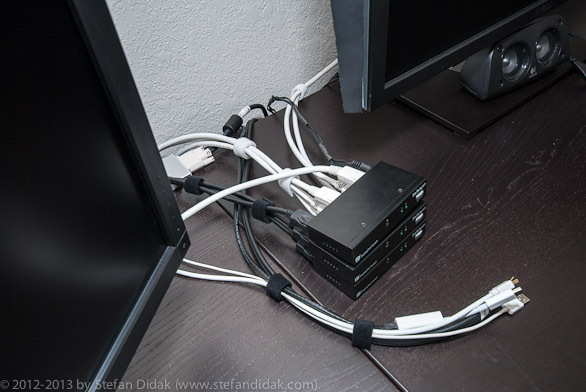 I know you can also do this with USB HUBS but I prefer to only use those if needed because USB HUB’s often require external power. 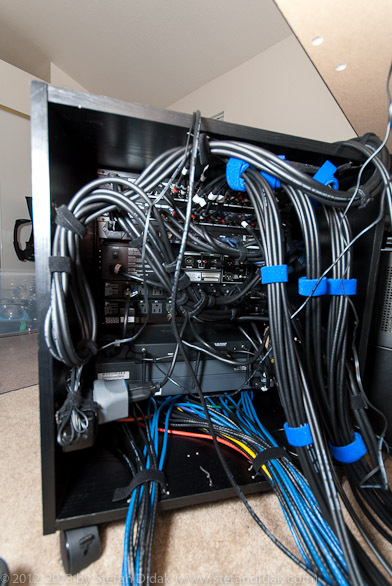 That would be a lot of external plugs that need power in my specific case. 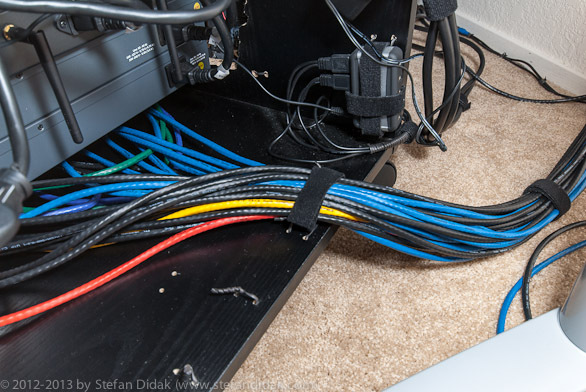 So extension cables are easy, don’t take up much space, you can use various lengths to get your inputs exactly where they are most convenient for you. The Mini ITX Xeon’s don’t run all that hot but they are small cases and you can stress them into something that I find a little to hot for my liking. So I got a few 140mm fans that I can turn on as needed and will provide some extra airflow through the side of the Lian-Li cases. 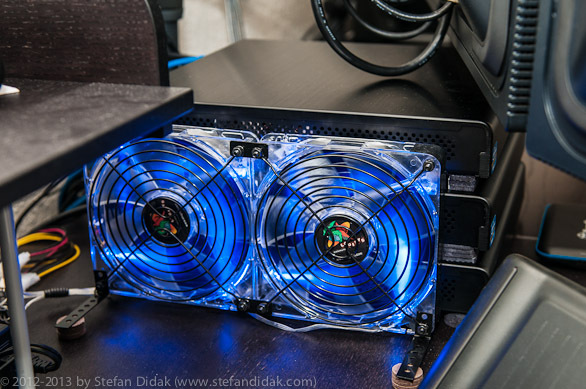 Powering the fans is easy. 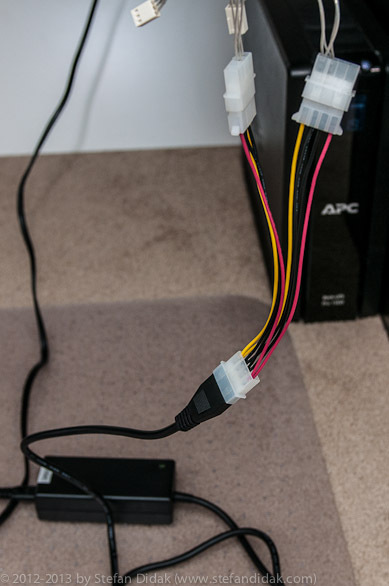 You just get one of those DC to Molex power bricks from the Cooler Guys and hook up the fan Molex connectors to a splitter and voila, you have instant power. 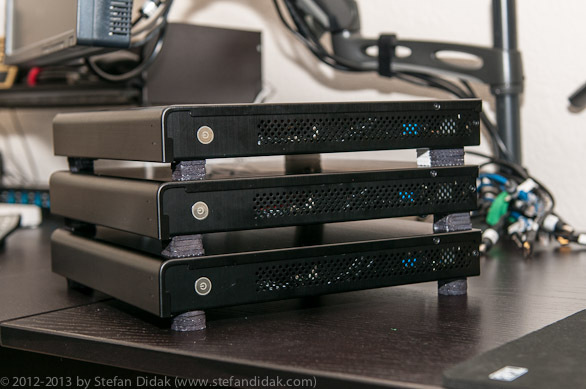 Vantec external USB 3.0 drive arrays. 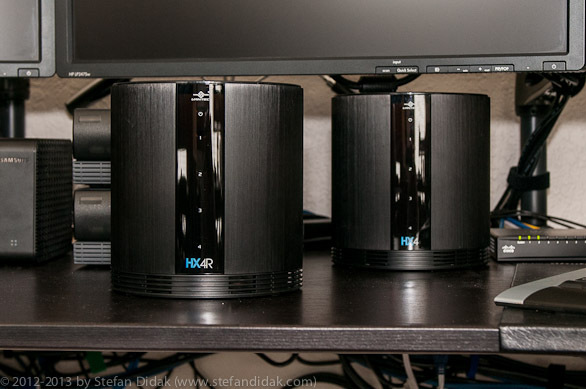 One with JBOD and one with RAID5. 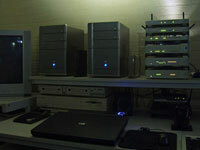 These are connected to the small Atom machines that run the DNS and other automation tasks on my network. 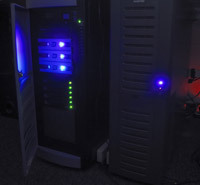 They also do duplicate automated local backups of other systems as a “third” level of backups (and versioning). 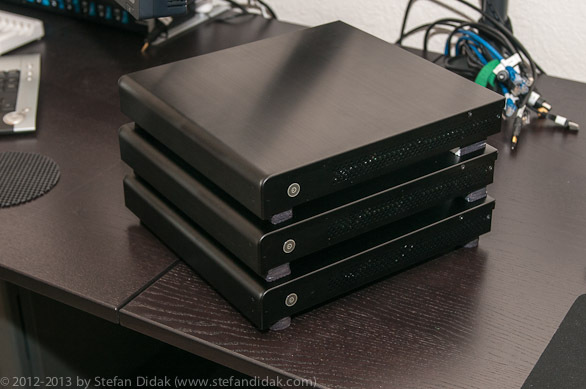 One with 2 x 30GB mSATA + SATA converters. 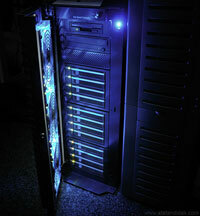 The other one with a 480GB Sandisk SSD. 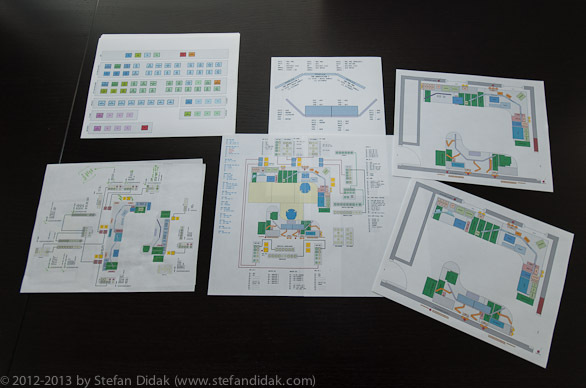 After redoing the plan on paper for the second or third time you should be good to go. 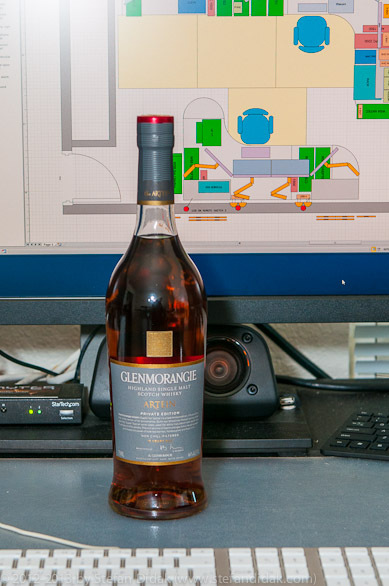 If you’re not I can recommend Glenmorangie Artein 15yr old to assist. Well, actually, scratch that. If you start doing that your paper plans will never work out at all. But you might get the point here; planning is important. Planning is the key to everything because there’s nothing so frustrating and annoying as to be knee deep in cables only to discover you needed another 20 amp outlet somewhere or you are dealing with cables that are too short and you have to order more or create more cables at the right length. Plan ahead. Then plan ahead some more! As for the bottle there, you can read more about it here. You will want to get loads of this. VELCRO. 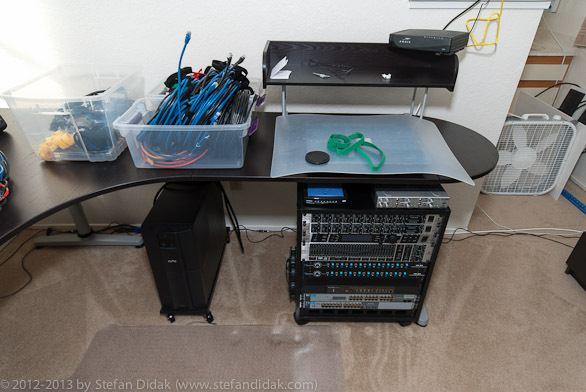 It’s your best friend when doing cable management. 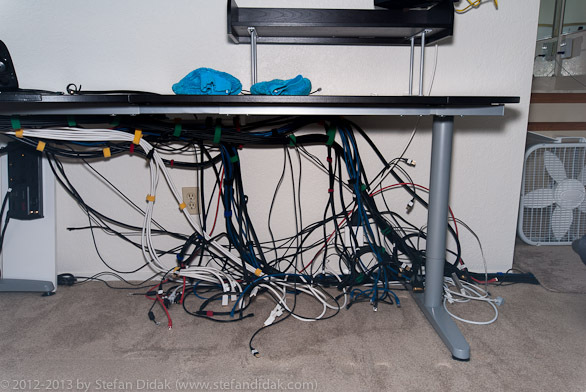 Especially if you are doing the cable management the way I have found works the best for me. 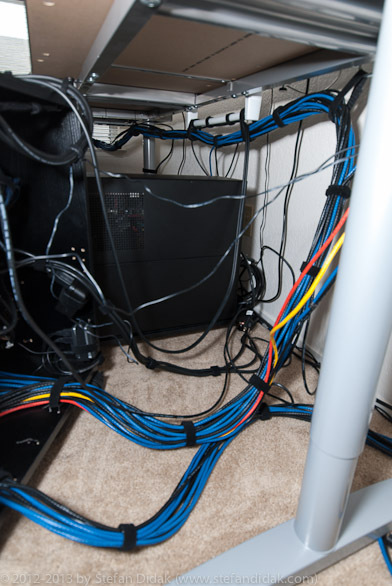 The stack of velcro rolls pictured about are just a small portion of velcro used in the entire cable management of the office. I think a total of 37 rolls of the stuff went into it. Also make sure you get all the colors you can get because those will help a lot when bundling cables of a certain type or purpose together. It makes your life so much easier later on down the road when you have to change something. The same goes for network cables. 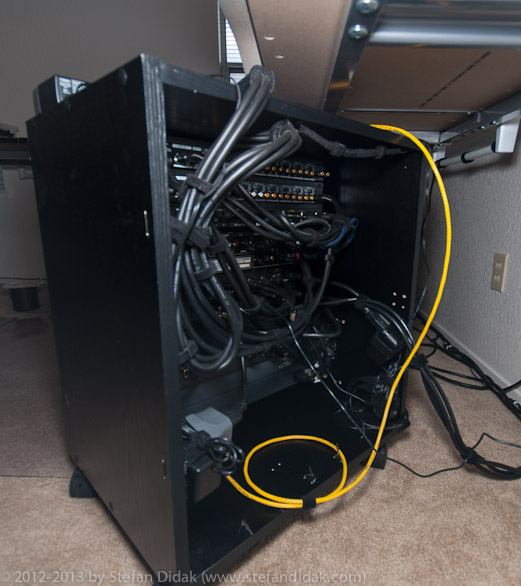 Get CAT6 or the best you can get because you don’t want to replace a ton of cables at a later stage. If you’re doing speeds that don’t require CAT6… get CAT6 anyway. The price difference is really of no concern. 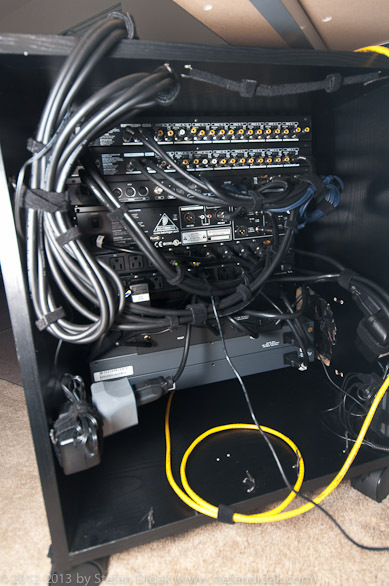 The picture above also shows that the cables from the switches and main DSR router are neatly guided through a guide panel at the bottom of the rack. 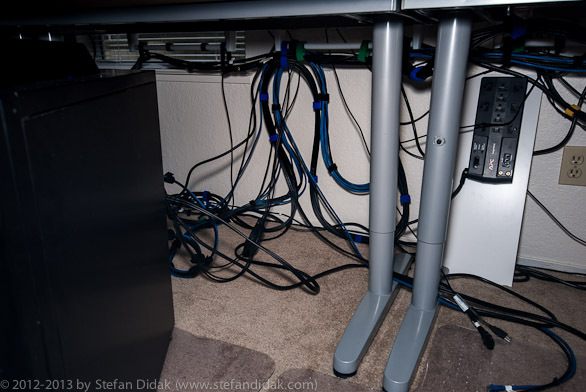 No way to trip over them, they are easy to deal with and it looks fairly neat as far as 50+ ports go. You might notice in the next series of pictures that things moved around a bit. Which would likely lead to you thinking I was stark raving mad. Which, I’m sure I am, but not because stuff kept moving around. 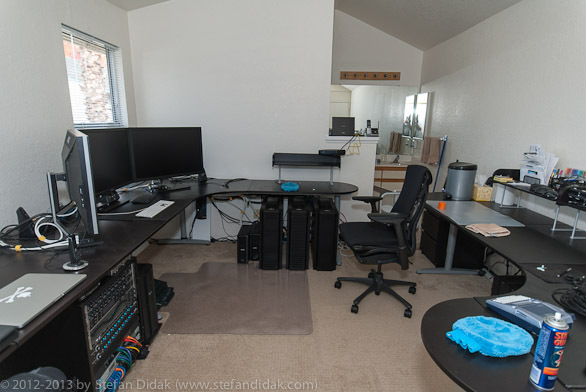 Some of these pictures were made after I decided to change things around a bit because the original plan didn’t work out as efficient or ergonomic (for me) as I hoped. 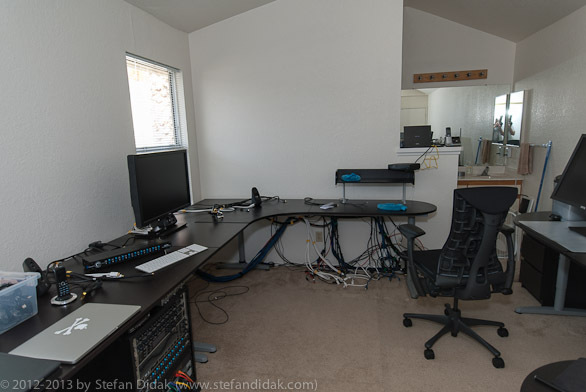 However, the pictures were already made and I didn’t feel like doing a whole series while dealing with cables and stuff. 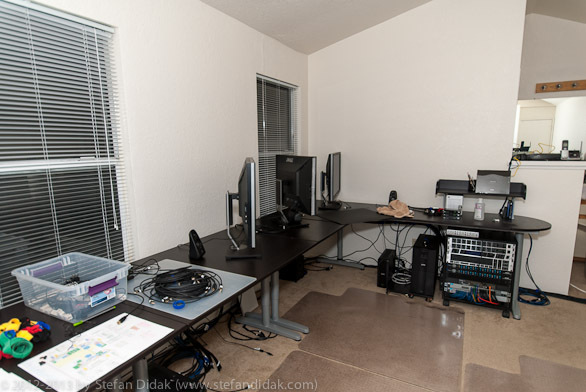 Here are some pictures of the first attempt at getting this 7.0 office going. 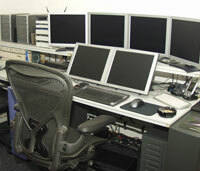 I started out having three of the main workstations next to me, under the desk there. It didn’t work out for me and when I started adding a few more I ran out of space to keep things together in a logical manner. 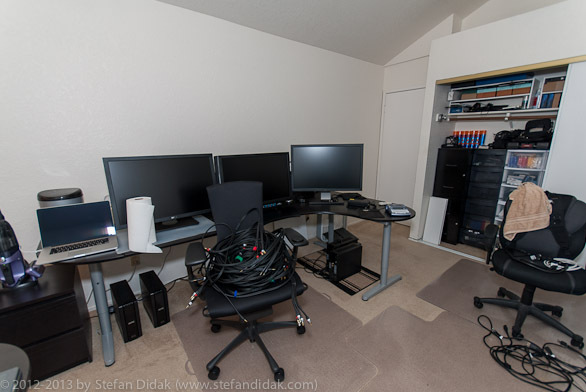 It was also causing problems with power distribution and cable lengths so I moved them after the fact. 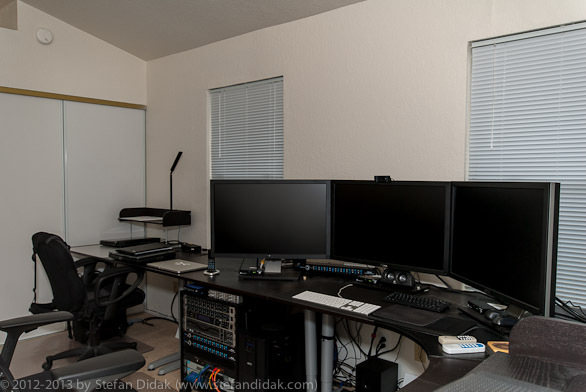 Starting to take shape with just the first 3 x 30″ DELL monitors. 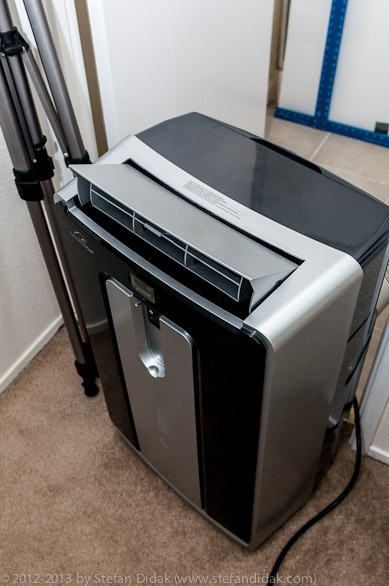 You can tell from the box fan there that I had to get some extra air flow going. 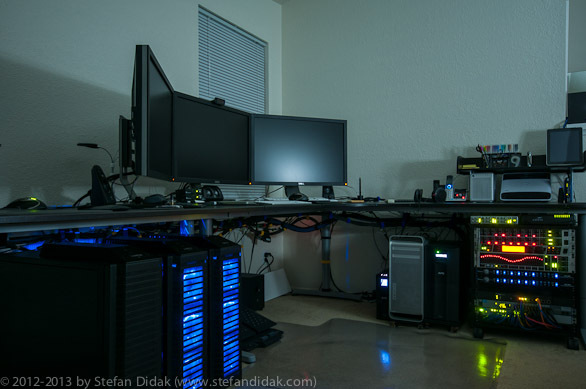 Not for any of the systems because most of them are all liquid cooled (I got away from fan cooling a long time ago). 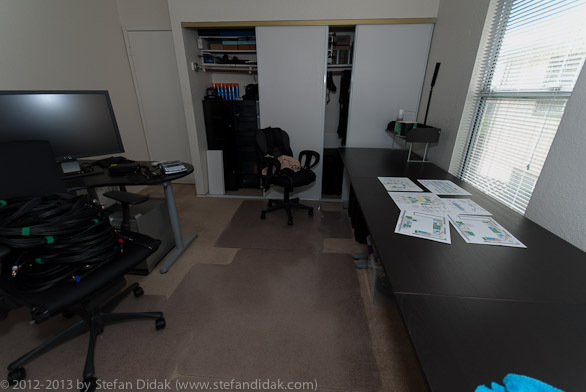 But it was really hot, it was summer, and the airconditioners (the central one and the extra mobile one in the office) couldn’t flow the air in the directions I wanted. Box fans are great for this. Half the office was still looking very empty because all my other stuff was still in Holland. Also, the newer systems I hadn’t even ordered yet because I wanted to plan ahead and make sure that the new purchases would be in line with whatever it was I was going to be doing. At the time I was still in the planning stages. Cables and more cables waiting for systems that hadn’t been ordered yet, hadn’t arrived yet, but I wasn’t going to wait with building the office. 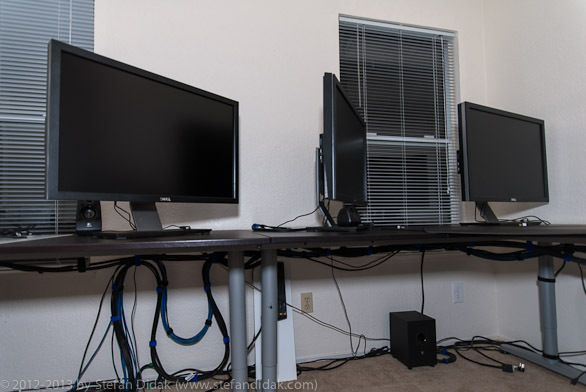 So I made sure all the cables I needed were already in place and ready to go. 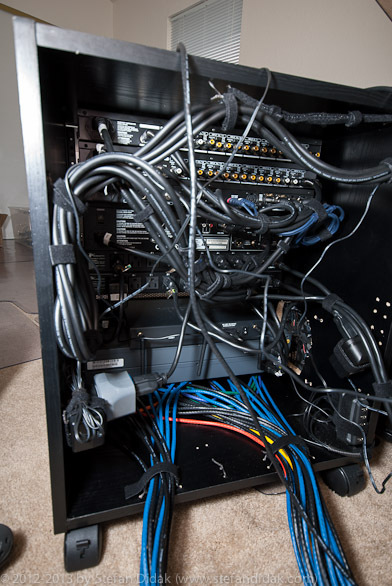 This is what it looks like when you undo all your velcro and cable management because you decided to start over at that particular stage because something wasn’t working out. What a mess! The other two were not too far off, though! Moving systems to the other side of the office, for good reason. Only to discover another cabling issue. At least I managed to take care of storage. Not the digital kind. 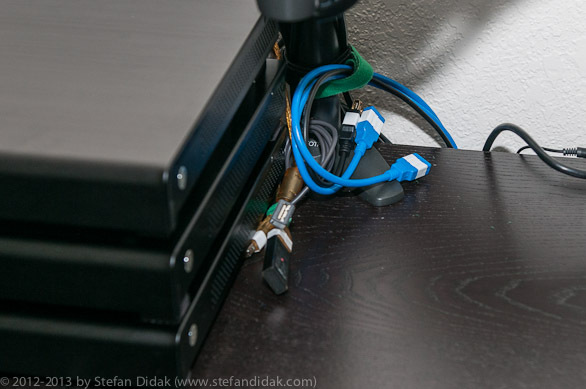 If you pay close attention to the side of the rack you will notice there are 2 x 2 of 8CM fans there, which are USB powered through a small USB HUB. I created a venting hole on the side so I could get some extra air flow through the switches at the bottom. 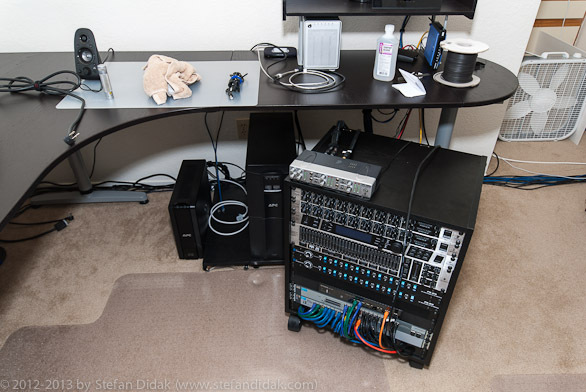 Those switches, especially when stressed with several simultaneous gigabit speed transfers tend to get a little hot and the HP switches I use don’t have fans in them (I picked them for that reason because I hate fans inside devices breaking down!). A labeler is a useful thing to have. Get one! 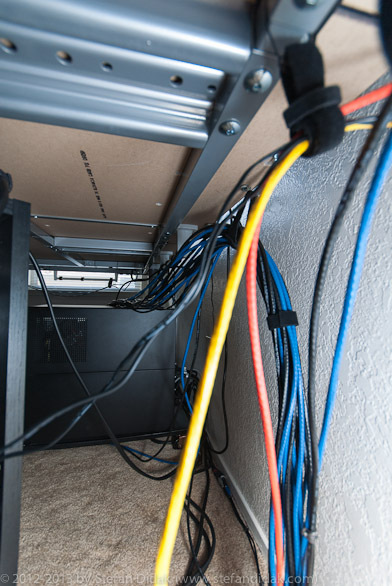 Laying out the network and audio cables and making sure there’s enough slack to hook up systems and when moved into place will still have enough slack to move forward in case of replacement or emergency maintenance activities. 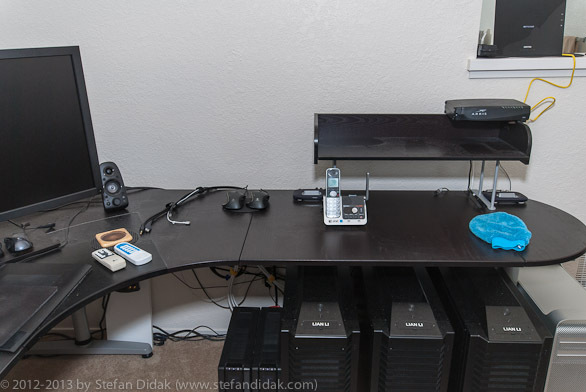 I used cheap plastic towel bars that I screwed firmly into the bottom of the IKEA Galant desks. 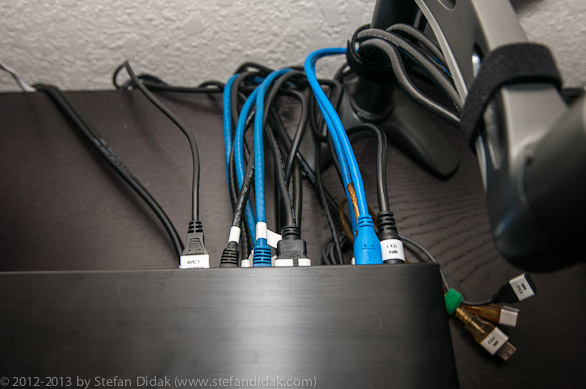 It’s easy to loop velcro loops around them and the cables and fasten/secure them and provide a clean and pleasing look. 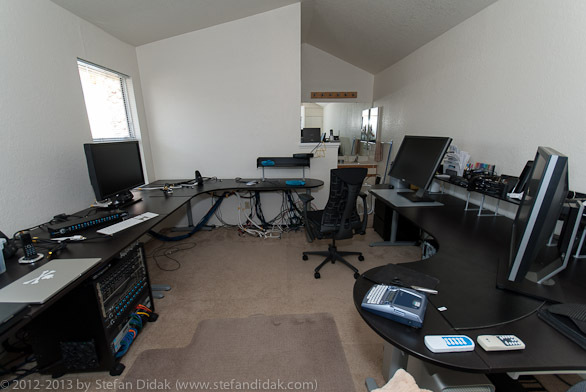 In fact, you can hardly see any cables when you walk into my office. 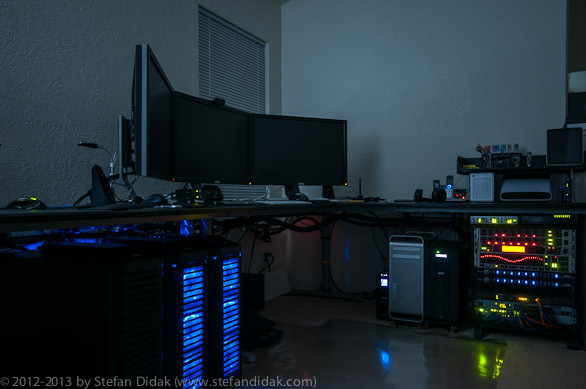 You have to physically crawl down below the desks to even see where most of the stuff is running. 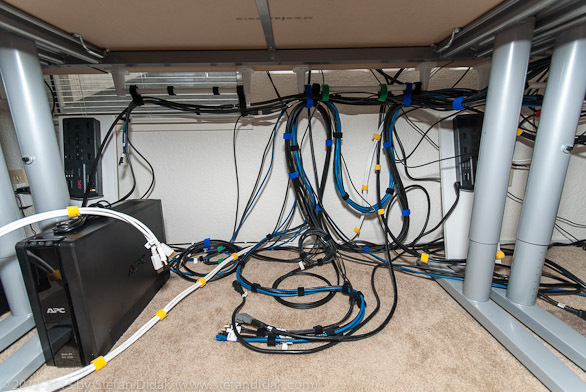 Just a bunch of network cables. 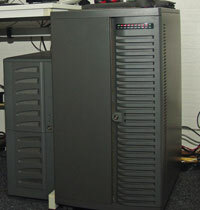 Moving the rack and the monster UPS into position where I eventually ended up deciding they had to go. More plastic crates of cables waiting for me to deal with them. 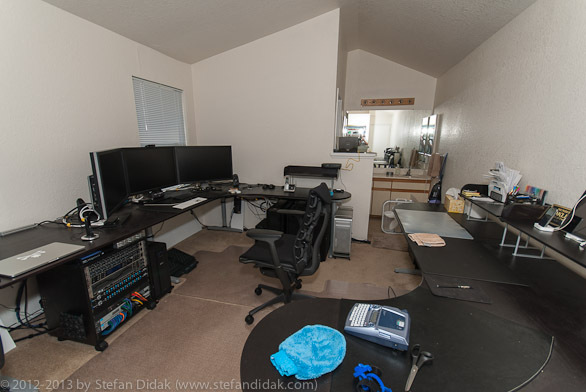 The office looked so empty and clean before I started adding all that stuff to it, doesn’t it? 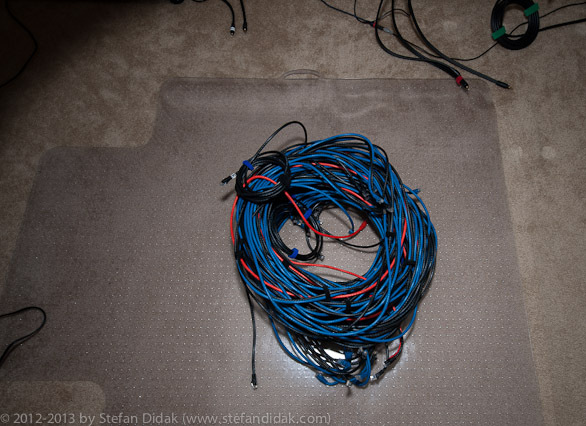 Audio cables. Power cables. Network cables. 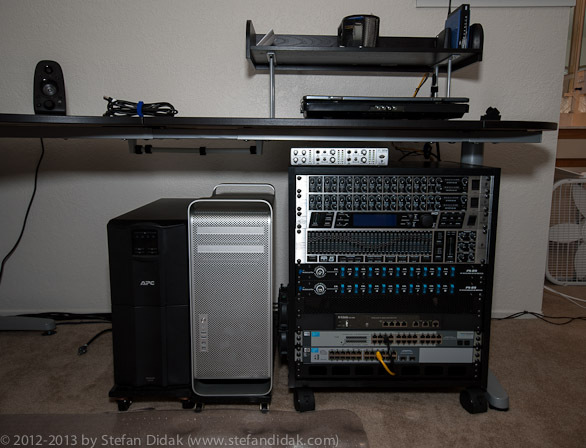 A bit more of a clearer view on the back of the rack. I threw a bit more light on there. 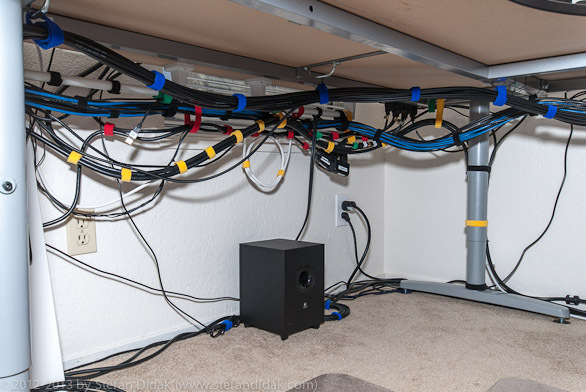 When mixing power cables, network cables, and AUDIO CABLES in a rack that offers only limited space to spread out the cables you want to make sure that all the audio cables are as far removed as possible from power cables and network cables. 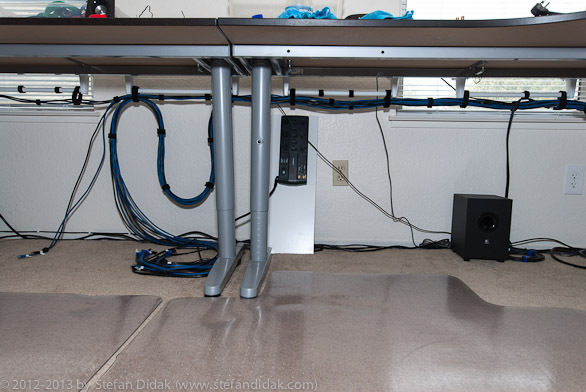 If you don’t the interference from the cables can cause strange static noise on the audio. 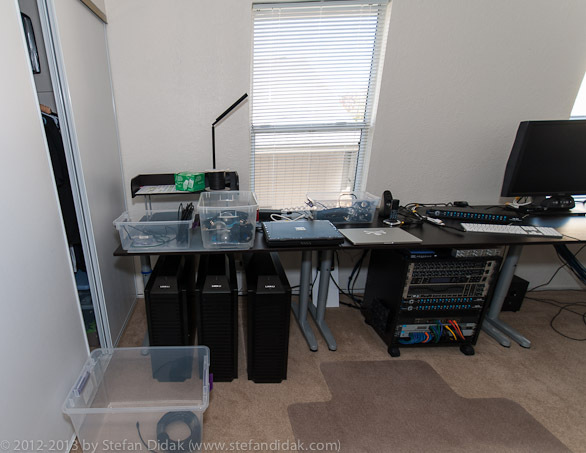 You do NOT want that to happen and certainly not after you spent a day building the rack and putting the cables in and you’re still a day or two off from being able to properly test it. I used a small media player to test each of the ports to ensure no noise would creep into the audio. So far so good. Got the 12-core Mac Pro with 128GB of RAM in there on wooden boards I got at Lowe’s and then wrapped in sticky black plastic. Call me a stickler for aesthetics but I couldn’t stand the wooden/white look of those boards. 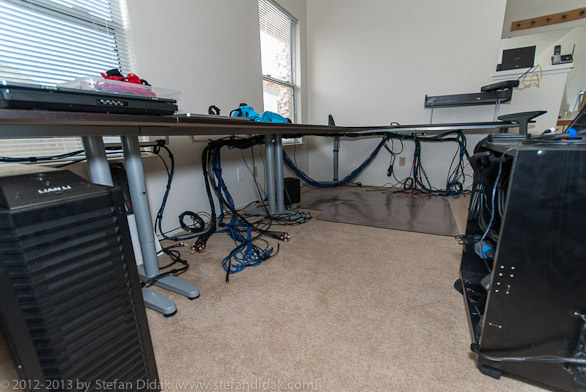 The monster APC is also on a board like that, with some coasters I put underneath, because that thing is so heavy you just can’t move it, especially when it’s placed on carpet. 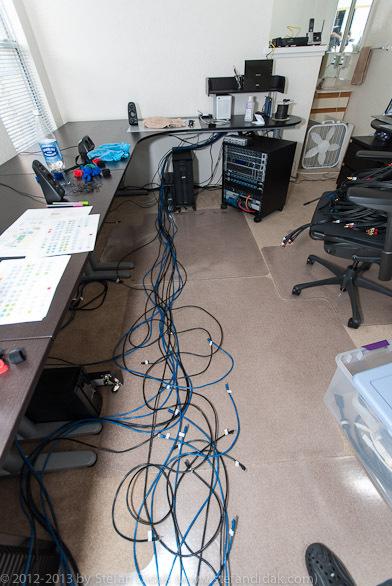 Things are still a total mess while the cabling enters day 2. Running the length of network cables from the back of the rack to the other side of the office where the systems will be placed that need them. Another towel bar. Wonderful stuff. 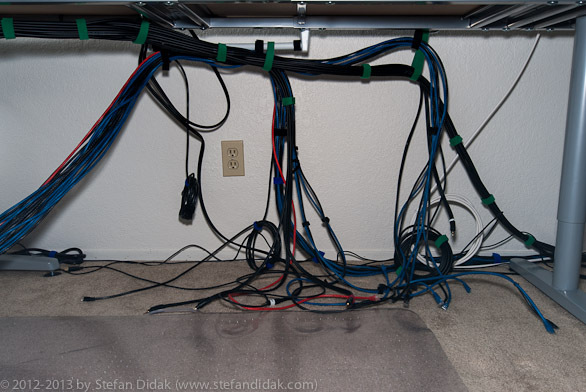 Always ensure there’s enough slack in the cables. And tie them up and down as needed. 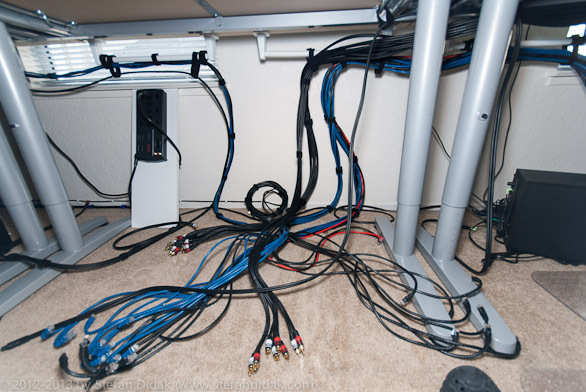 Bundle groups of cables by their purpose and location. 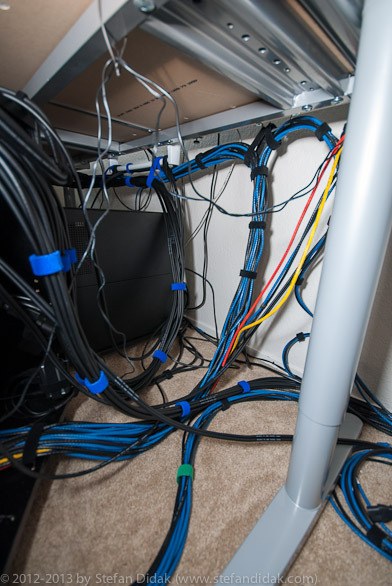 Cables going to one side of the office are bundled with velcro. Cables going to the other side get their own bundle, etc. 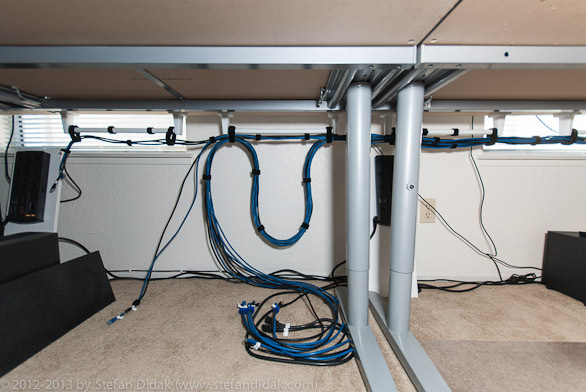 When running out of space for towel racks the IKEA Galant desks have enough metal frame to run a few twist wires or twist ties through to use as holders for the loops of velcro needed to “hang” cable bundles off of. A close-up shot of what I just said. 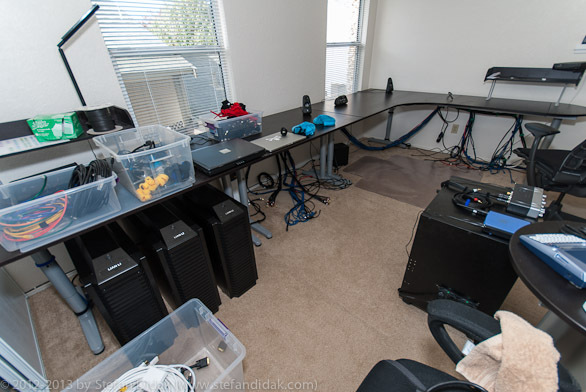 How long it takes me to put all those cables in, all cables, and build up the office as you see it taking shape here and how you can see it in its final form? Around 4-5 days. Full time. Yes, it’s a bit of a chore. But worth it. The rack is starting to take shape but up to this point it was already a good half a day of effort. It might still look like total madness but it’s actually quite clear. 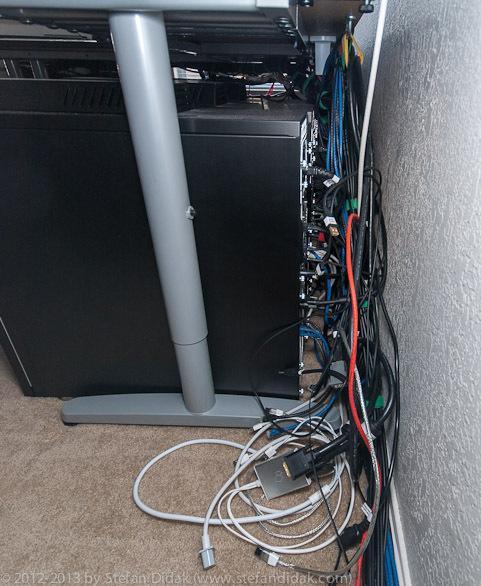 You can’t see the labels on the cables all that well in this picture but trust me, everything is labeled. And another shot of cables for you cable lovers out there. A wider shot to show just how neat things can be if you put an effort into it. 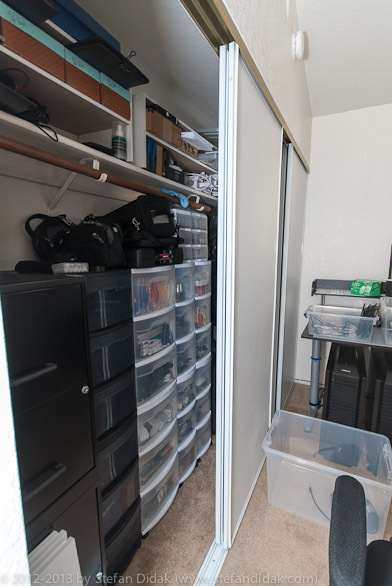 The two white shelves there are to cover up cables that run on the ground. You can tell they are white shelves but you have to look for it. 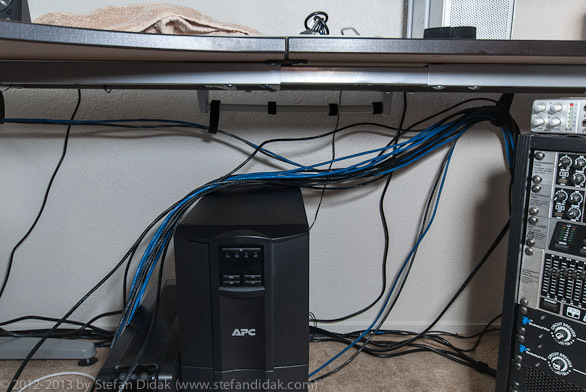 Otherwise it just provides a cleaner look to what otherwise are ugly thick black power cables. Bundles are getting ticker as more stuff gets wired up. 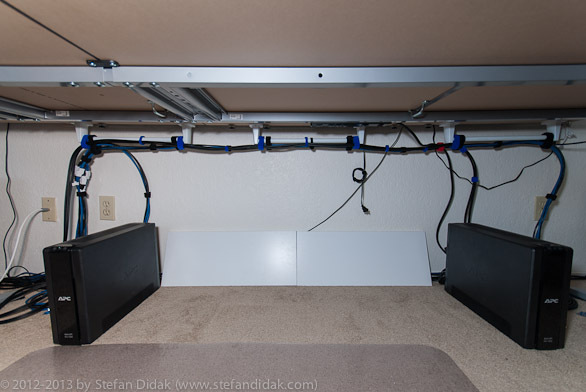 The rack now has all its audio cables hooked up. Blue velcro = audio. So much cable and yet not a single system hooked up yet. Day 3. Moving the monitors into place. 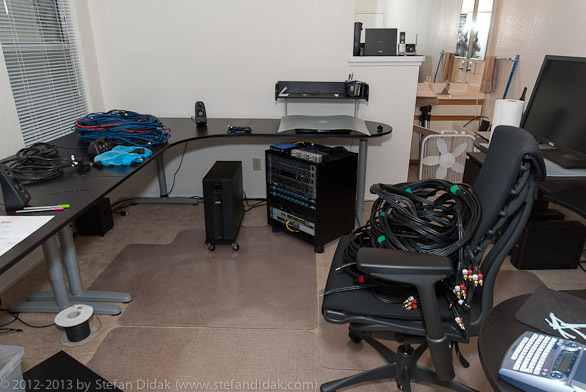 And for more stuff to hook up we need, guess what, more cables. It just never ends! 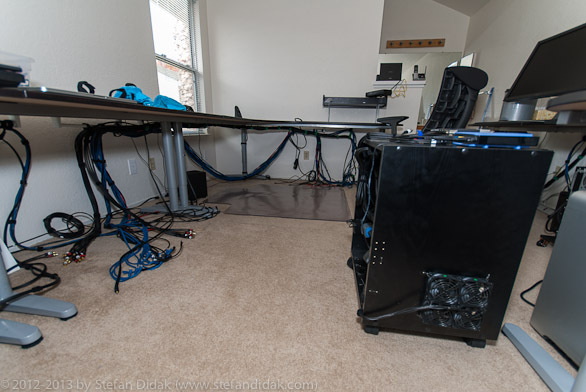 Hooking up some workstations with their required cables. Notice the slack in there? 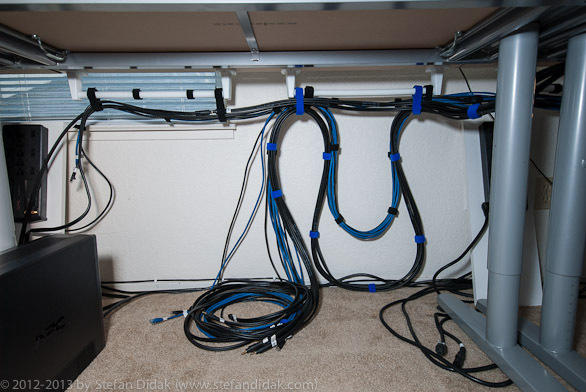 Give your cables enough slack (I can’t emphasize this enough!) and you will be happy when moving stuff in and out of their locations. 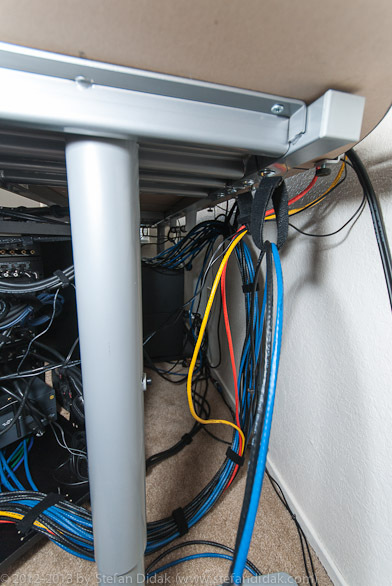 While hooking things up the cables will still look like a pile of crap that nobody could ever make sense of again but once you have things hooked up you will use… more velcro! 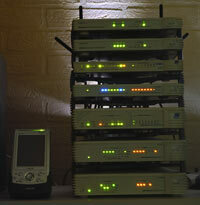 Another shot of the StarTech Display Port switches. They do need power, though. 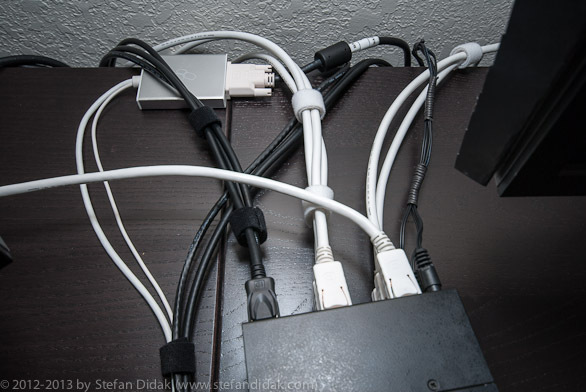 White and lengthy DisplayPort cables. 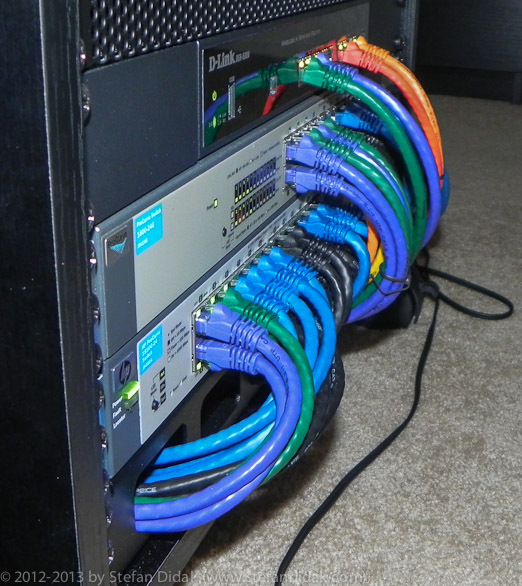 Blue and Black network cables. And some more cables! 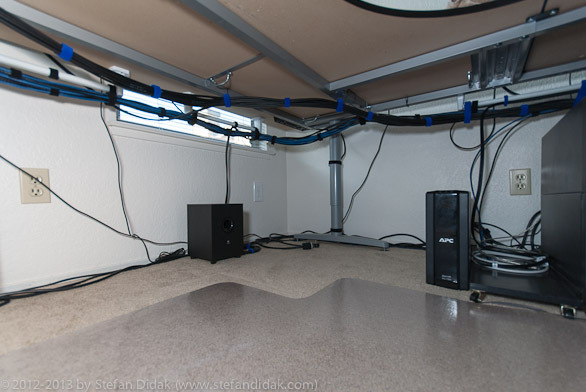 Blue velcro for audio cables. Red velcro for power cables. Yellow for monitor cables. Black for other stuff. 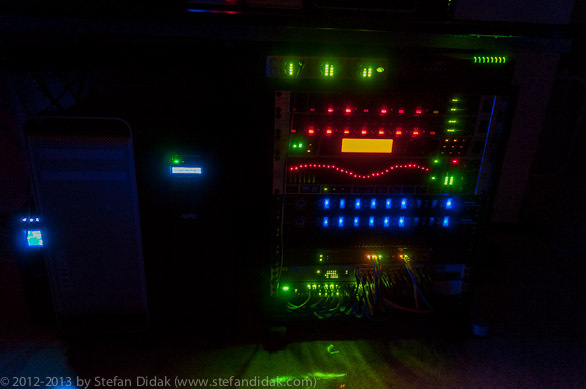 White for external devices and green for USB cables.